The newest Britt's picks. I like the new Inspires. I wonder if they are a Going Grape/Black Grape Space Dye. The Wunder Under Pants looks like they are some kind of space dye or stripe pattern. There is an interesting new print that I would call manifesto camo. I'd be interested in a gray/black version of this but am not into the green. I wonder if that space dye or stripe patterned WUP is made of Rulu or pique kinda of fabric? Any input? I just read on HEYLULULEMON that LLL adjusting the price difference for FTBW bras owners from $48 to $42 ( that's how they were initially marked at the store by mistake)!!!!!!!!! Some online purchasers already received an email offering them refund of a diffence. I didn't receive the email, but I emailed them. I love the new Inspires and the green camo looking Trackers but I might not buy either of them if they don't give us a coordinating Cool Racerback. I feel like there hasn't been any CRBs and that they haven't been coordinating colors like they used to. Loving the Out of This World Dress. I got both the Racer Back and Noir Dresses from the Lab Series and wore them a lot more than I thought that I would this summer. It would be nice to have a comparable midi dress with sleeves like this. Hopefully the price point won't kill my dreams. Any idea how much? Argh! they just wasted the Osaka print on the refresh racer tank! I have the inky floral wonder unders in full luxtreme, and they are the best! I went mountain trailing and rock-climbing in them over last weekend and they were absolutely perfect. Worn them at least a dozen times already for runs and errands as well, and I have no loose seams/pilling complaints. If the WUC are of the same material, I'll highly recommend them. OOh I'm liking the manifesto script camo SS, but not sure if they are too similar to the curious jungle ss that I recently bought on WMTM. The manifesto camo is very old school lulu, I like it. The inspires will probably show sweat. @ anon 8:13 am - thanks for the heads up! @ M - good point about the Inspires. @ anon 8:27 am - good point. I would love a solid fuel green CRB. The Inspires look like a "Heathered" Purple Fog to me with Black Grape accents. All my Inspires kind of show sweat but that happens to me with almost anything that isn't solid black. Even though the FTBW is currently sold out, so not visible on the website, if you do an internet search for Lululemon FTBW, it clearly shows an online retail price of $42.00 for all color variations. I just got off the phone with LLL US, 877-263-9300, and reached GE "Kaylie." I asked her for a refund for the difference between the Tuesday price vs. the current online price, esp given fact that my shipment hasn't even arrived & my local store still has my sizes in both colors I purchased Tuesday, for $42 each. "Kaylie" put me on hold, and when she returned she said that the ONLINE LLL STORE considers my request a price adjustment and that "LLL online cannot do a price adjustment on their end." When I asked her "to dig deeper" into it because I'd read here @LuluAddict that other online customers who'd ordered this were receiving emails offering a price adjustment," she put me on hold again, and when she returned gave me the price adjustment for both FTBW bras. Success, ladies, and my having a nice attitude certainly didn't hurt! And almost immediately I received an email from LLL stating the refund credited! I really like those inspires but I got the heathered gray ones and they definitely show sweat. So much so that it looks like I peed myself. I now only wear them to run errands. totally OT but has anyone tried the Bakhti shorts? i am thinking of returning mine and waiting until they go on WMTM, but if anyone LOVES them, do tell! 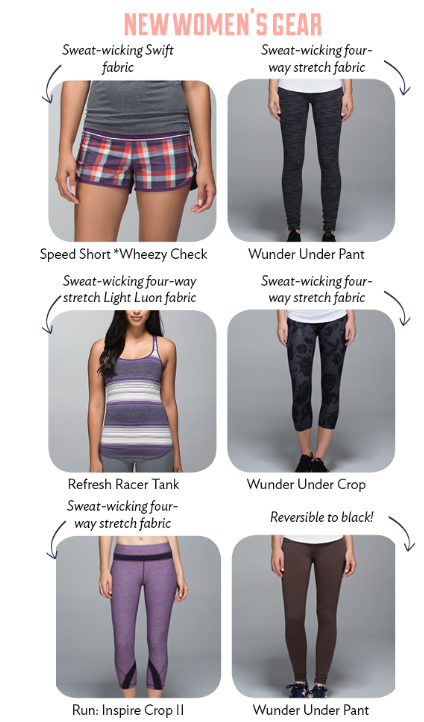 Love the Wheezy Check Berry Yum Yum shorts. Not a fan of the manifesto camo. I am camoed out. I get the impression that we won't see many CRBs this season or next. I think they had every intention of phasing out the CRB in favor of the Refresh Racerback and gave most attention to the Refresh design for fall/winter. After all the commotion over the idea of the CRB going away, they assured that it isn't going away, which I hope is true (I have my doubts). If that is the case, we may not see more CRBs until spring, since there is a months-long delay between production and release. @ anon 10:18 am - totally agree about your CRB theory. They were sort of tapering out earlier, too. I still haven't bought a Refresher Racer tank yet. Thanks for the heads up about the refund. I went into the store yesterday and they were still marked $42, but ringing up $48 and the Ed checked the price and they are supposed to be $42. I will wait for the email to come and if I don't receive it, I will be emailing them! Too bad they won't throw in a gift card for all our troubles and certain items being cancelled after receiving order confirmation, but that wouldn't be right! I guess real the prize is that we actually were able to get our orders through whereas so many other people were not. Just received my fuel green wu roll downs and despite the horizontal pictures on the LLL site (Canada), the ones I was sent (in Canada) are vertical. They are soft but thinner than last years coco pique I bought. I can verify that lulu is giving $6 refunds for the FTBW bras. I hadn't received an email, so I decided to chat with them. The GEC said they were going through the orders and issuing credits to those who ordered the bras. Since I had contacted them, they went ahead and credited the money back to my credit card. I did find the grape one tighter than the ones I bought earlier this year but not enough for me to size up. However, she said that some people are having to size up. FTBW bra - this is not a size up or size down item for me at all. I bought the grape/bumble in size 6 which is the same size as my last FTBW and in regular FTB. If anything, this FTBW might be just slightly looser than my other one but it's probably just due to the grape luxtreme (my other is tonka stripe/antidote). I have worn it for a bit but not for any activity yet but I expect it to function the same as my other for hot yoga. Even though I love it, I won't take the tags off it for 2 weeks. As for price, I paid $42 in store and I'm in Canada. As for the support level and those that are too well endowed: "designed this light support bra...for the small-busted yoga enthusiasts among us" and "light support, low coverage"
I was one of those who got both my FTBW orders cancelled. :( One literally sat processing for DAYS no less. No FTBW for this girl over here. So sad. However, on HeyLululemon they put out a thread and said that it is in fact going to be a core piece for the Spring and Summer of 2015 so i'll just have to wait. Hopefully they'll have nice colors for spring/summer this year instead of the boring black, tan and gray. I bought a Refresh Racer Tank that went on MD at my local store to try it. I LOVE it! Almost more than my CRB's! It performs so much better for running than the CRB does (doesn't ride up at all!) and even in daily wear I don't have to keep pulling it down like I do my CRB's. I hope they keep both actually since I buy and wear both for different activities. I hope to increase my Refresh Racer tank. I saw a pic of a CRB in the Toothpaste color so I don't believe they were totally phasing it out as that color in that tank had to be in process months ago with everything else coming out now. So if they had plans to replace it, it wouldn't have come out in the Purple Fog and then the Toothpaste color to come. I do wish they'd put out colors to coordinate with speeds and crops though like they used to. At the same time. Like the Fuel Green CRB to match the Camo Manifesto speeds so you can buy a whole outfit at once. I tried the inky floral WUC yesterday en NYC and they were thick and opaque, beautiful! I didn't get them because I got the seek the heat in that print, but I'm having seconds thoughts, they were really flattering. I'm loving the manifesto camo print, hope to see it crops!